Mr. Xiong’s ideas on Augmented Reality Technology and Early Childhood Toy Products are considered leaders in the industry. He has been honored with several prestigious global awards. Mr. Xiong gained in more than ten years experiences in fields like advertising media, film and television production, the game industry and other multimedia-related industries. He was among the first TV producers who combined the format of a classic TV show with electronic video games. Additionally, he made public the World Cybercrime Conference (WCG) in China. 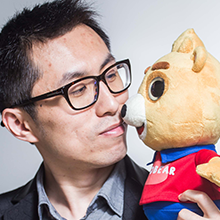 In 2012 he founded the “NEOBEAR,” a creative technology children’s brand which will capture the hearts of children and their parents all over the world.